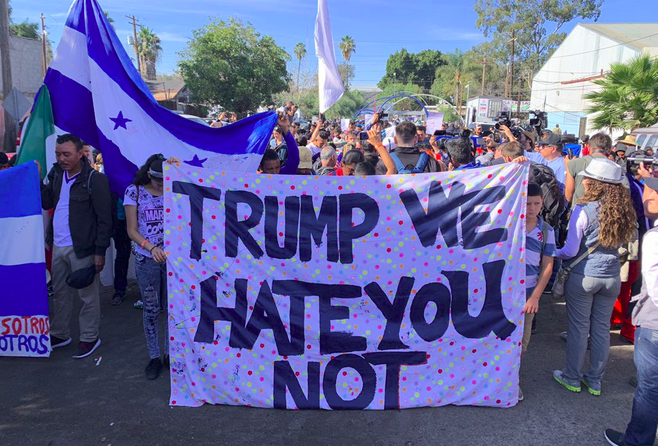 The United States of America's border in the San Ysidro Port of Entry is being flooded with foreign invaders, hundreds of whom are seen rushing the US Border with Mexico to demand entry into the nation. Mexico has steadily opposed the largest majority of the caravan into the United States of America, by both mass-deporting citizens of Honduras, and offering shelters to those in need of legitimate assistance. Fights and profanity-laden battles with Mexican police forces can be seen on videos making their rounds across social media, while the White House has yet to issue a statement on the incoming invaders. Liberal propagandists are attempting to doctor videos in order to suggest that the invasion is somehow “peaceful,” disproven by raw video footage from the scene. The United States of America's Customs and Border Patrol has issued a shutdown of entry to everyone until the invasion can be calmed, albeit the “migrants” say they're determined to enter if it means life or death. This is a breaking story, we will update with any additional information as it arises. Lying bastards don’t even have the decency to carry an american flag. Maybe the should rubber mats around the fence and electrify it. A big bug zapper would turn them back. The issue is threats with no follow through. It’s like the death penalty.......in about 20 or 30 years after the crime.